Jeff and Dyan deserve today's post since they have just hosted a birthday blowout. 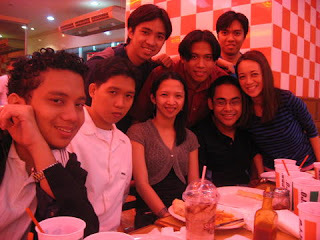 Dyan's (my G23-2001 blocmate) birthday is actually every January 13; however, since Jeff's (Circuit '01 kabarkada) birthday is on the 15th, it's very practical to have a joint celebration instead. 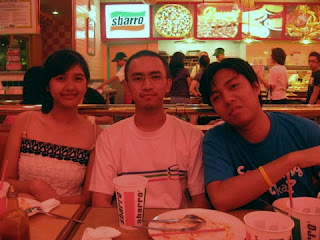 After some deliberations from the experts (c/o May), we eventually ended up in Sbarro. 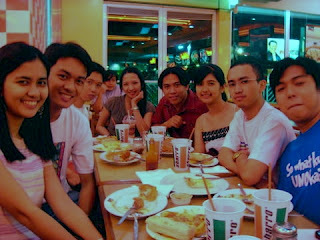 Dyan correctly predicted that the typical choices of bday blowouts would be on these kinds of fastfoods. No loss for me since this was actually my first time in the pizza-pasta establishment. In fact, anywhere is fine since today was a Sunday, meaning there was no paid dorm food waiting. So I get to have free dinner! Good timing, hehe. So we ate pizza and pasta. No further explanations. Except that CL and I became a bit shy on ordering. We followed May and Nino's style of 50/50 for each pizza and pasta; the others were able to order a whole of each kind. Jeff even exclaimed that he did not become scared of our orders. He had high expectations that we might order too much, but we didn't. Taga-UP kasi e, hehehe, tipid. Introducing... the latecomers Norman(1st row-far left), Ivan(2nd row-far left), Carlo and Karlene(magsyota - far right) Not in picture: Liz who was very late and ate in Mcdonalds instead. 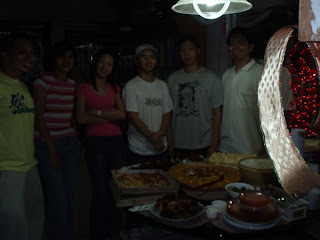 Last week, January 6, it was Bevan's birthday and we were invited for dinner at his home in UP BLISS. Among those present were Elma, Norman, Dyan, Allan Gordon and me.